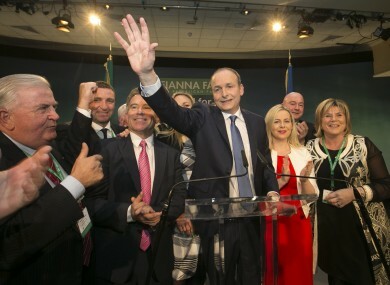 FIANNA FÁIL LEADER Micheál Martin has warned of the ‘risk’ the public is taking by voting Fine Gael back into government. In his keynote speech at the party’s Ard Fheis this evening, Martin repeated the party’s aim to challenge the concept, pushed by Fine Gael, that the only option for the next government is one led by Enda Kenny. “Let no one tell you that there is no choice – that we just have to let them carry on,” he said. We can’t risk more chaos in our public services. We can’t risk massive waste on bodies like Irish Water. We can’t risk the growing inequality. We can’t risk the charge after charge heaped on families. We can’t risk more of the arrogance, the refusal to plan, the blocking of political reform, the addiction to telling stories rather than tackling problems. He also accused the current coalition government of taking credit for Fianna Fáil’s work, mainly that of the late former finance minister Brian Lenihan. Enda Kenny is a man fond of telling stories about men with pints and the army at ATMs. But the biggest fairy tale of all is his claim to have delivered recovery. Secure home ownership and tackle homelessness. Detailing the policies Fianna Fáil will follow if elected to government in the next general election, expected to be announced within a matter of weeks, Martin said the continued “drift” into a two-tiered economy needs to end. The party aims to achieve this by investment in core infrastructure, ensuring every Irish child has access to career guidance and counselling, and broadening apprenticeship schemes. As part of this drive to create “decent jobs”, the party will also ban exploitative contracts that offer employees little security. Together with a number of other changes and increases in social protection and pensions, we will deliver an affordable and fair increase in disposable income for all. We are going to get an independent analysis of our commitments which reviews the accuracy and affordability of our costings and their impact on economic growth. We will publish this with the manifesto. Other aims will be to get tough on crime, ramping up garda recruitment, restore the cuts made to drug squads across the country, and introduce mandatory sentences for repeat burglary offenders. “People need to know that gardaí will be there when they need them,” Martin said. Martin has repeatedly cited homelessness as a major crisis facing country that remains unaddressed, recalling earlier today how a mother-of-five approached him in a shopping centre to say she had spent the past two months living in a hotel. The party aims to boost rent supplement and introduced a “help-to-buy” scheme to allow people to access housing. Email “'We can't risk another five years of Fine Gael and its cheerleaders'”. Feedback on “'We can't risk another five years of Fine Gael and its cheerleaders'”.